Inside Eddie revealed we're having an initiative to increase the crowds to 500 and a wee mention of the upcoming Cliftonhill centenary next Christmas. Good to see Eddie being so positive. 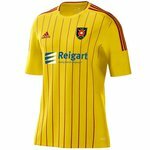 Ayr United, top of the Championship, who, in L1 beat ARFC by 46 points last season, and are now top of the Championship. Edinburgh City, who were in the LL 2 years ago, but now sit top of League Two, 35 points ahead of ARFC (of course ARFC have a game in hand which I almost forgot). All of these were below ARFC in the league when Ronnie and Eddie took over. Astonishing is all I can come up with. I hope that this doesn't become common knowledge in football boardrooms, as it leaves the club open to ridicule, if being tailed off at this point in the season is not enough. I suppose we could put it down to the Pantomime Season being in full swing. If we weren`t a laughing stock before now we will be if this gets wider circulation than the `Tiser. Embarrasing. Could it be that Eddie has possibly been misquoted by someone trying to stir. If that is the case then I would expect the Advertiser to print a full retraction next week....NOT ! RotR, for those of us who don't subscribe to the 'Tiser, can you clarify what was said on the inside pages. Hopefully it is an exciting initiative that the people of Coatbridge will find irresistible. The club cannot exist on crowds of 200 or so, certainly not if the object of the exercise is to retain SPFL status in the long term. I think the Chairman could have put a little more thought in what he said and may be forced to eat his words come the end of the season. I also did not think we were in a "very stable financial position" but I'm very, very glad to hear it. Don't mean to put a spanner in the works, but no amount of initiatives will work while we have that current team. 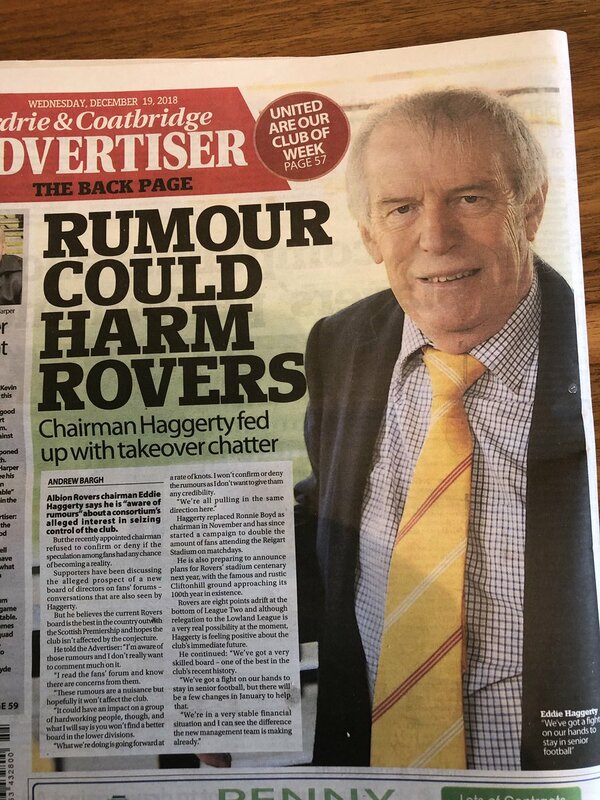 I'm not sure if rumours of a boardroom takeover will harm Rovers. I think much more harm will come from having amassed 5 points by the middle of December. Eddie and the Bod are trying their best with little resources. If all the so called supporters got behind then we might turn this ship around. They have my 100% support. I suspect there's an agenda with some people secretly wanting a seat back on the board. Oh yes there is. Interesting times ahead me thinks. Might be wrong but imagine the advertiser has badgered Eddie for comment for a few weeks. He’s probably not wanted to comment but felt he eventually had to get his side over as they’d run A story anyway. While the best board is a bit far fetched did we really expect the man in charge of the board to come out and say we have a crap board and we’re doomed?? Little wrong with what the chairman is saying if a tad over optimistic. No surprise that the usual suspects quickly appeared sniping. Tedious. We are where we are and there is still half a season to go with the prospects of a few new faces in January. To all the board keep on plugging away while we wait for the cavalry to arrive. If it ever happens, forgive me if I don't hold my breath.